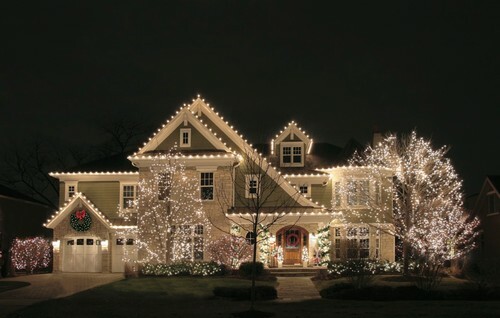 Framing a home in a glow of lights can show off your holiday spirit and your home this season. Depending on how much you commit too, you could become the talk of the town. But there’s that fine line between magical glow of holiday spirit and, well, the one that sent Clark Griswold from “Christmas Vacation” yelling expletives. A recent Boston Globe article offered tips from the pros in getting the former, and not the latter, in your holiday light display this season. Select a color palette. Will you do white lights or multi-color lights? Choose one and stick to it. Keep your color palette simple, such as with just warm colors or just cool colors, suggests April Tougas-Schavone with the Tower Hill Botanic Garden in Boylston, Mass., which hosts a big holiday lighting event each year. “You get a much bigger impact if you stay with one or two colors rather than following five different colors in one area,” she told The Boston Globe. “It looks much more professional and refined.” Also, choose between traditional incandescent bulbs and more energy efficient LEDs. Choose the bulb size. You also have choices of mini lights or larger C7 or C9 bulbs—plump, old-fashioned Christmas lights. Some designers like to hang these in vertical strands from high branches, or to use meteor or snowdrop lights. These lights are a dripping down ball of light through a tube. The plump C7 or C9 lights can be good for using on evergreen trees or along rooflines. Wrapping tree trunks or branches with a tight coil of mini lights is always popular, designers say. “They take the longest [to install], but they’re worth every minute,” Michael Rose, owner of Christmas Décor by Suburban Lawn and Sprinkler Co. in Framingham, Mass., told the Boston Globe. Test out your lights first. Nothing is more frustrating than spending hours stringing lights but then finally turning them on to admire and finding they don’t work. Test the lights out before you hang. Check for safety. The Consumer Product Safety Commission estimates there were 14,700 decorating-related injuries treated in U.S. emergency rooms during the 2016 holiday season. Forty-one percent involved falls. Use a sturdy ladder and be mindful of safety if you’re installing the lights yourself. Also, check that all of the lights and extension cords are rated for outdoor use. Don’t use cut or frayed cords or any lights with cracked bulbs. Experts recommend plugging the lights into a ground-fault circuit interrupter (GFCI) outlet, which will automatically shut off power if a ground fault is detected from water or a damaged cord. Purchase extension cords or adapters that add GFCI protection to any three-prong outlet. This is exactly why I leave the big decorating like this to professionals. Some people have a knack for the Christmas decorations and really enjoy it. I always feel overwhelmed with all of the choices. Nice article. As the upcoming holidays get nearer and nearer, it’s necessary that these preparations are made!